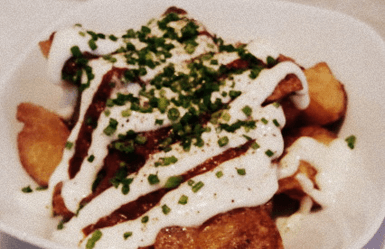 If you had to make a list of top Spanish tapas, I’m sure one of them would be Patatas Bravas (or as locals say, just “Bravas”): Spanish fried potatoes served with spicy sauce. Each local bar makes their own sauce (which recipe is often kept in secret), and as a result, the same dish can change a lot from bar to bar. This is why I encourage you to order Patatas Bravas in a few different places and judge for yourself which ones you like the most. To make things easier, today we are sharing which are our favorite. 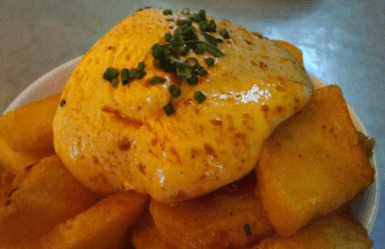 A legendary bar said to have the best patatas bravas in town (or maybe not, keep reading). Bravas from Mandri come with two sauces: one is allioli (garlic mayonnaise) and the other is a red pepper spicy sauce. Locals prefer to order both sauces and mix them with the potatoes, rather than eating each sauce separately. I love both sauces, mixed or not: both are worth trying. Their bravas potatoes come with “romesco” sauce, a Catalan specialty made with tomatoes, grilled red pepper, garlic, vinegar, almonds or hazelnuts (here is my mom’s recipe for this sauce for patatas bravas and other veggies). 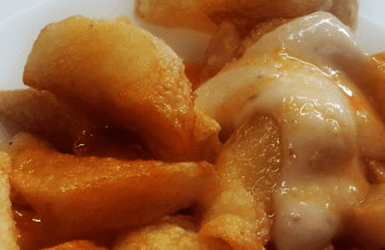 This bar is located in the Carmel neighborhood, relatively close to Park Güell, which gives you the perfect excuse to eat some brave potatoes after visiting the most beautiful park in the city! In this bar of the Born district they cut the potatoes in large halfmoon-shaped slices and serve them with two sauces as well: a tomato-based sauce with spicy touches and a garlic-flavored alioli. These sauces are just very mildly spicy, so they are ideal for those who don’t like spicy sauces but still want to try them. There few places where you can order more than one version of bravas, and this is one of our favorite. They offer “braves d’aquí” (braves from here) and “braves d’allà” (braves from there). Braves d’aquí are served with only one sauce: red spicy alioli. Braves d’allà come with two sauces: mayonnaise and a mild spicy tomato sauce. On top of this, both dishes come also dressed with spicy olive oil. It can be fun to order both of them to compare and decide which ones you like the most. While half Barcelona considers Mandri’s brave potatoes are the best in town, the other half of the city prefers those from Bar Tomàs. In my opinion, the winner would be a combination of the potatoes from Tomàs and the spicy sauce from Mandri! So maybe you should pilgrim to the city uptown and try both to decide. The patatas bravas with aioli from Tomàs are thick, irregular and well-cooked. They are crunchy from outside and soft from inside. Yum! So what about you? Head to the comments below and tells us: have you ever eaten bravas potatoes and did you like them? WHERE IS THE BEST CALÇOTADA IN BARCELONA? WHERE DO LOCALS GO FOR TAPAS IN BARCELONA?